The lot once slated for a Jay-Z-owned hotel along side the High Line will soon be home to a LEED Platinum office building. Designed by Cook + Fox, the nine story tower will be developed by the Albanese Organization. The building will feature ample terraces, a green roof, and individually controlled HVAC systems. 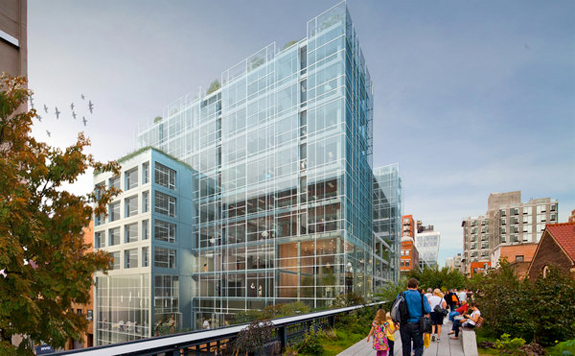 The High Line façade of the building will have balconies that will directly engage employees with the park. The balconies on the rear of the building will relate to the other new high rises in the area. Being in the Chelsea Arts District, the ground floor retail space will likely be rented to a gallery or event space, while the rest of the building is zoned for offices, retail, hotel or non-profit use. Once a main tenant is secured, Albanese can begin construction on the green building, making it an exciting alternative to Midtown office buildings.